DETIK.COM Indonesia is soon the arrival of a new OPPO flagship smartphone called F9. Readers can continue to see the birth of the successor to the OPPO F7 in this direct report, where the program is scheduled to begin at 2:00 p.m.
OPPO F9 was finally born in Jakarta. OPPO F9 Sunrise Red and Twilight Blue can be ordered today. These two editions are officially sold on August 31 at a price of Rp 4.299 million. While the 6GB RAM edition is available on September 15, and the Starry Purple version is September 20, 2018. Many advantages of OPPO F9. Among others, VOOC Flash Charge that can be used while using a cell phone, full HD plus screen, 25 MP front camera sensor with AI beauty, two rear cameras with portrait features, slow motion, intelligent battery management to fingerprint, octa core CPU, and dual sim. For enthusiasts, OPPO F9 Sunrise Red and Twilight Blue can be ordered today. To prove the fast charge of VOOC, the battery in the previous smartphone is around 35% at 15:17. With VOOC Flash Charge, 70% is now filled in 20 minutes. Good news for PUBG fans. That is collaboration with PUBG for costumize to adjust the OPPO F9 screen and notification block when playing games and can chat while playing. OPPO is known as a Selfie Expert leader. The reason is because OPPO cameras present high-quality photos that can be directly shared. Whereas the most shared users are portraits for bokeh and selfie. OPPO F9 itself has 2 rear cameras 16 MP + aperture 1.8. In terms of photographing faces there are problems that are often experienced that the face looks blurry and not bright. Well, the feature in OPPO F9 can solve this problem. 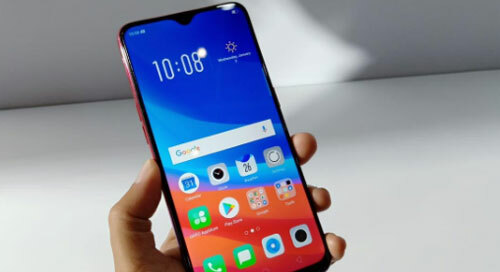 The 6.3 inch OPPO F9 screen is very relieved with a percentage of 90.8%. Suitable for video streaming and gaming and right grip. OPPO F9 brings a new fashionable art design with two gradations on the smartphone body. Unlike rigid electronic items, the OPPO F9's back cover displays a different light when viewed from various angles. Inspiring natural landscapes full of color gradations, OPPO brings Sunrise Red and Twilight Blue colors inspired by the colors of the night. The color choice of Starry Purple displays stars. This OPPO cover displays a colorful and dimensionless texture. The OPPO F9 security system has several levels. Suwanto said, the first is about the adapter, where he implements a sensor that can detect and guarantee it will remain stable. The second level they embed the chip so that the power is safe when filling a large current. Then, also implanted a chip that is able to drain large power through the USB cable to the battery so as not to overload the power. Finally, if there is an overload, the charging will be stopped. VOOC Flash Charge technology has received a lot of recognition from the media, users, and others. They revealed that VOOC Flash Charge is better. With VOOC, when the cellphone is charged in the morning, when it is about to leave, the cellphone is full of batteries. Suwanto as the OPPO Indonesia Marketing Planning Manager began to go onstage to give a speech. He said that through F series, OPPO had brought a selfie trend, but did not stop there, they also added other innovations. For example, the VOOC quick refill feature that is characteristic of OPPO. VOOC can be used both when the screen is off or on so it can be used when the smartphone wants to be used. Also without heat so it is safe and convenient for users.